Our first two stops in Houston and Los Angeles have been mutually beneficial to both the symplr team and the attendees. 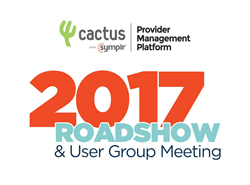 symplr®, a leading provider of Software as a Service (SaaS) based healthcare compliance and credentialing solutions, today announced that the “Cactus from symplr: 2017 Roadshow and User-Group Meeting” will meet with customers and partners in Atlanta, Georgia, March 6-7, 2017. This is part of a five-city, two-day educational event where the symplr product team will reveal the company’s product roadmap, discuss industry trends affecting healthcare credentialing, host regional user-group networking opportunities, and conduct hands-on product training. Click here to learn more and register to attend.